What happens when you book three of the most thrilling international performers in the electronic music world? smalltown. Taking place in the afternoon to the night, this edition will be situated in a stunning outdoor, inner-city location. There aren’t many artists who can currently lay claim to being more celebrated than Stephan Bodzin. His live melodic version of techno is designed to stay with you long after the final beat has ended, inspiring fans to reminisce via online videos which always receive hundreds of thousands of views. Good news: he is returning. 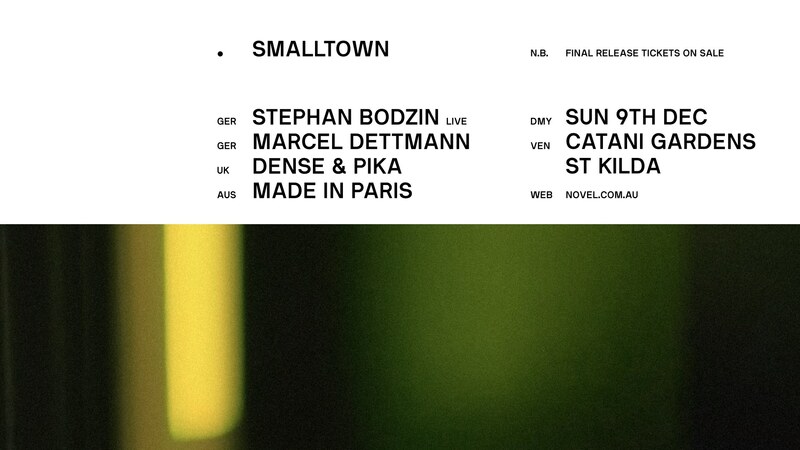 Marcel Dettmann’s Teutonic brand of techno has turned him into a global superstar. The fact that he is a Berghain resident sometimes overshadows his true appeal: a performance machine with a technical proficiency rarely seen, a DJ metronome who never misses a beat. Pay attention, the master is back. The duo of Dense & Pika inhabit a space which many artists unsuccessfully try to reach. Their accessible style of techno never takes itself too seriously, yet it displays a niche edge which appeal to purists of the sound. For proof check their Essential Mix earlier this year, an absolute masterclass in showcasing all shades of techno. Local support comes from rising Sydney star Made in Paris. The Upon Access label owner has pushed all the right buttons lately, finally fulfilling many industry insider’s predictions of her being the ‘one to watch’. We are very excited to finally have this future star on a smalltown lineup. This edition of smalltown operates on Boon Wurrung country, we acknowledge the Yaluk-ut Weelam Clan as the traditional custodians of the land and pay our respects to elders past & present.